Thomas’ literary bent continues in the way he handles The Sandman. 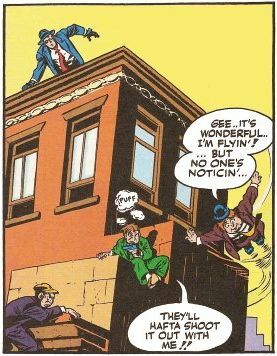 Our villain is familiar enough at first, though readers expecting the striped-shirt Sandman of Amazing Spider-Man fame may need a moment to recognize the disguised Sandman, who is sporting his Frightful Four costume. Posted on December 3, 2014, in The Dollar Box and tagged Herb Trimpe, Hulk, Marvel Comics, Roy Thomas. Bookmark the permalink. 16 Comments. 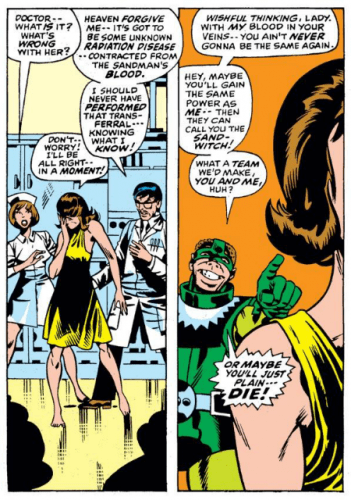 My heart always sank a bit when I saw Herb Trimpe was the penciler on a comic, but you’re dead right about this one. That page with the drainpipe is superb. I wonder who the inker was? 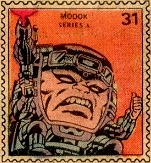 Herb Trimpe may not be my favorite artist, but I definitely like his work. 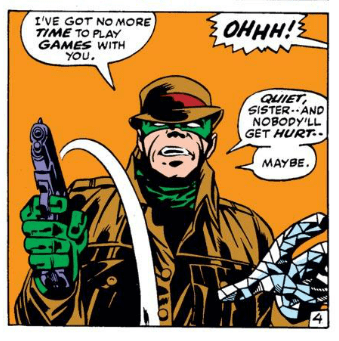 He reminds me somewhat of Sal Buscema (although I like Sal more) in that both were good, solid storytellers who could always be counted upon to turn in a more-than-acceptable job while always meeting the monthly deadline. 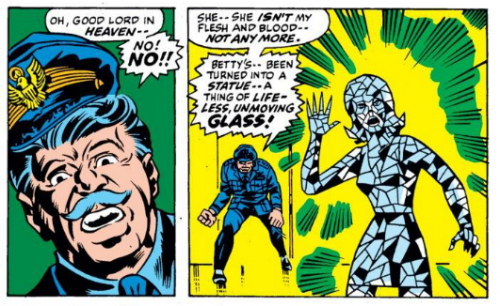 Not everyone can be Jack Kirby, who was both fast *and* amazing. I would certainly take Happy Herbie Trimpe or Our Pal Sal Buscema over most of the hot artists who have come to prominence throughout the past quarter century, the ones with insanely-detailed over-rendered styles who are constanly blowing deadlines. 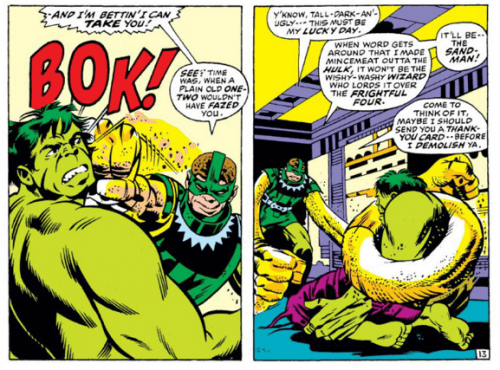 Trimpe definitely has his admirers, among them Savage Dragon creator Erik Larsen. Trimpe actually collaborated with Larsen on two of the stories that are going to appear in the upcoming SD #200. Nice to hear from you, Ben! 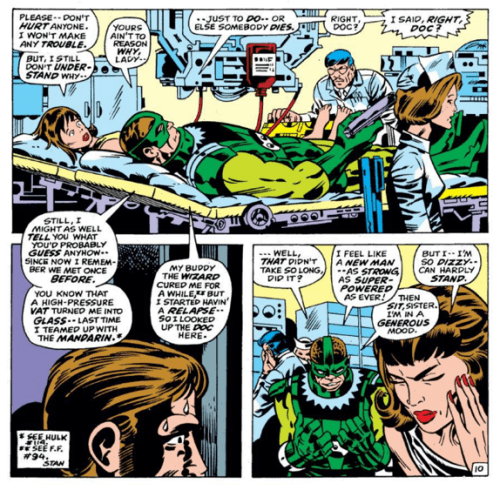 This is not the first time you’ve come to the defense of Our Pal Sal … and while I may not be on Team Sal with you, I think you might eventually walk me over to Trimpe’s side of the aisle. I need to give him another look. 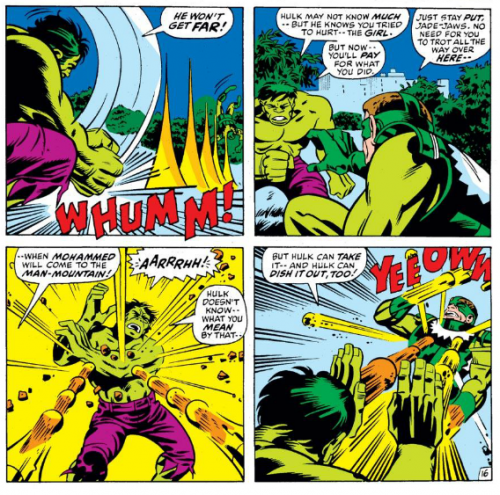 There’s a fascinating moment in Sean Howe’s book Marvel Comics: the untold Story where he records a time when Sal Buscema’s work was criticised for being old-fashioned and he responds by producing a blistering issue of the Hulk. These guys could turn plenty of pages around fast so we shouldn’t criticise them too much. You have to be an incredibly good artist to get a gig like this in the first place! Yes, it is usually quality art, or on-time art, but rarely both — the best comics artists develop a sort of shorthand that guides them through their 24 pages while saving a day or two to do that second or third book of the month. 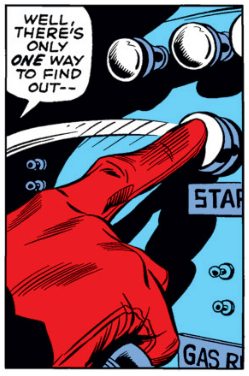 And to be fair, the work of someone like Sal Buscema or Herb Trimpe looks better when reading their book once a month, rather than one right after another in a long continuous run, where the seams (and the repetition!) begins to show. As artists for a serial monthly medium where quality wasn’t always a selling point, they were superior craftsmen (and could sometimes be quite brilliant, as in this issue). Absolutely. It’s no mean feat to crank out, in one month, a complete visual universe full of character design, clothing, three-point perspective, architecture, and portraiture – all in a commercially viable style under intense deadlines. It’s why we refuse to criticize even the artists that don’t float our boat so much. If only we had half of Trimpe’s skills, we’d be cranking out comics, too! And that nine-page panel set to poetry – great find, Paul! To the argument that these comics were aimed at adolescent male readers, we agree. 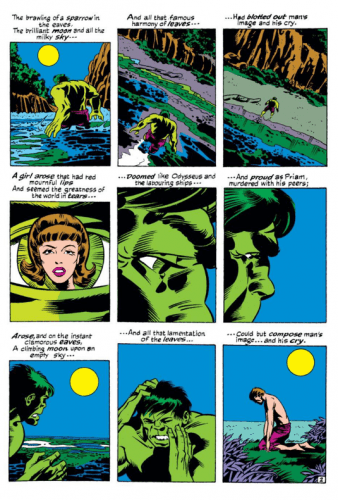 But at the same time, how many of us developed an early love for literature, poetry, and fine art thanks to moments like this in our favorite pulp entertainments? If we were just a bunch of kids reading pulps, then Roy Thomas and writers of his caliber were storytellers who, instead of talking down to us, dared to expand our horizons. The best comics creators never really think of themselves as comic creators. I am convinced of it. They are making comics, and are acutely aware of it, but they don’t use that as an excuse to reach for something more. Even if no one else believes, they do. Happy Holidays, Mars, always great when you stop by! Yes, I’ve generally avoided Trimpe but he is in very fine form in this issue … and the brilliance is all in the layouts. The inks are fine but the artistry is coming from the pencils. I really think it was just an issue of time with Trimpe. He was grinding so many pages a month that he couldn’t help but cut corners some of the time — all comic artists do the same. 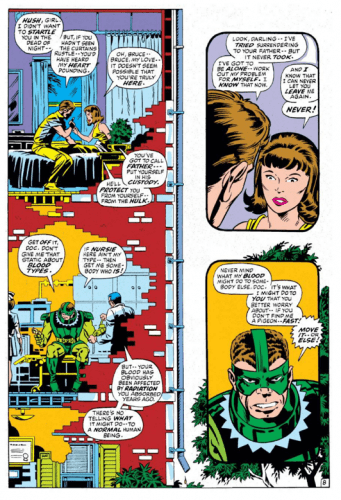 For whatever reason, Trimpe really cut loose with this issue, and the results are magic. Hulk Smash Puny Dollar Box! I hate to be one of “those guys” but the Sandman’s costume is from his Frightful Four era, not Masters of Evil, right? Doubtless you are correct — I will adjust my text. 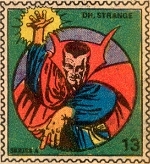 Thanks for the catch … your Longbox Graveyard No-Prize is (not) in the mail! 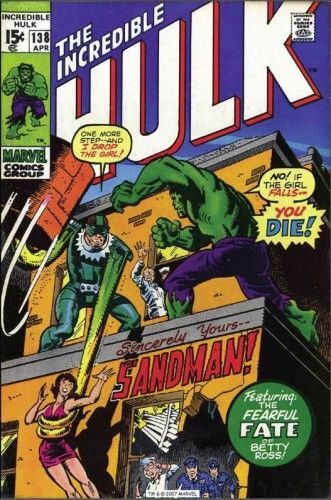 Pingback: Longbox Graveyard: Sincerely, The Sandman | Back Issue Heroes!